This course challenges students who continue at this level to refine their skills in fine arts media and creative problem solving. These problems become increasingly complex and require students to draw upon knowledge of both traditional and contemporary art from diverse cultures. This course is recommended for students who have demonstrated an ability to work successfully at a demanding pace. Emphasis is placed on creative problem solving, independent research, and task commitment. All work will be graded not just the final assignment therefore everything must be turned in. Performance assessment based on concepts and techniques taught throughout the year. A portfolio review will be included. 1. Promptness to Class - Before the late bell rings you should be in class and ready to work. If you are late for any reason please make sure you have a pass. Sign in and do not disrupt instruction. Tardies will be addressed by following school wide policy. 2. Attendance - All absences will be verified on Aspen. You will be allowed to make up work with an excused absence. This may have to be done after school if you cannot catch up during class time. Extra studio time will be on Wednesdays – 2:15- 3:30PM. Make use of this immediately. 3. Effort – Creating art takes time and perseverance. When in class you must be working on your art, not other subjects or socializing. Quiet talking and movement around the room is part of the relaxed atmosphere of the art studio. However noise levels must remain low. Courtesy and cooperation are of key importance for an effective working environment. 4. Attention – Pay attention to instructions and demonstrations. This is where you learn new techniques and how to apply them to your assignments. At this time refrain from all talking and socializing. If you do not understand ask for clarification. 5. Materials and Supplies- STUDENTS MUST BRING A PENCIL TO EVERY CLASS. 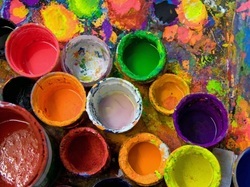 Rules and procedures for proper maintenance of art supplies must be followed at all times. These are shared with many students taking art courses. Instructions and rules for health and safety must be observed by all. Please clean up and put away all materials in their proper place. It is essential that the classroom is left clean for the incoming class. 6. School rules – Respect and follow school rules for electronic use, appropriate clothing, food /drink, and language use. Infractions will be handled according to school policy.